Working side-by-side with physicians, surgeons, and dentists, Certified Registered Nurse Anesthetists play a crucial role in the healthcare team. A subset of advanced practice nursing, CRNAs fulfill their job duties much like a medically-trained anesthesiologist, but follow a faster track to joining the workforce. Aspiring nurse anesthetists can take advantage of online learning throughout their education, from undergraduate through recertification requirements. This guide informs students of their options for online degrees and how to earn their credentials to get started in this well-respected career. Successful completion of a CRNA program can open the door to a variety of career options, and allows students to become key team members within the healthcare system. A quality CRNA program should teach the field-specific information needed to excel in the field while preparing students for real-world situations. To help students know which school is the best for them, we have ranked schools with CRNA programs based on factors such as class size, cost and availability of student services. 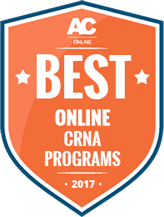 Check out the top CRNA programs for 2017 here. Took courses in physics, biology, chemistry, and mathematics. Gained experience as a working RN, spending two years in acute care in an ER. Completed accredited nurse anesthesia master’s program. Passed The National Certification Examination for Nursing Anesthetists. Landed a job as a nurse anesthetist at in local hospital’s surgical unit. Online nursing programs work to build student-faculty relationships and mentorships unaffected by distance learning. Students and educators communicate through interactive learning tools that include multimedia presentations, streaming and live lectures, social media, voice/text chat, and discussion boards. Course requirements, deadlines, and the class syllabi are all delivered online for tracking progress. Faculty contact, peer collaboration, and library resources are facilitated by 24/7 access to the class presentation software. University nursing schools and programs that are accredited by the Council on Accreditation of Nurse Anesthesia Educational Programs offer degrees that meet training requirements for the workplace, licensing, and certifications. Students can log into their classes from any location by computer or smart phone, completing their education while maintaining work and family commitments. Self-paced components are designed to be done at the student’s convenience, whereas live lecture programs are offered by phone/voice conferencing on a strict schedule. Online degree programs may also provide starting dates throughout the school year. Online programs eliminate most travel and students are not charged for fees including parking, library access, student activities and athletics. Accelerated nursing degree and certification programs may be comprised of short semesters, cutting time to graduation and overall tuition costs associated with traditional campus programs. Accredited nursing schools offer the same federal student financial aid programs to qualified online students that are given to on-campus nurses. The online BSN degree is comprised of 120 credits, with 75 credits in nursing core studies and the remaining units in general education. The degree is suited for nurses looking for future graduate work or interested in bolstering their careers to move into advanced roles. Students can expect curriculum in health assessment, data and human resource management, microbiology and chemistry. Courses are completed primarily online, with clinical hours completed at facilities located near the student. Online MSN degree programs are 60-credit programs open to licensed RNs who hold a bachelor’s degree in the field. Accelerated master’s programs—also known as an Entry-Level Masters degree—are available to students who hold a bachelor’s degree in a non-nursing discipline. Typically, the curriculum is built around advanced nursing studies along with electives in the chosen professional specialization (anesthesiology included). General core studies include courses in ethics, pathophysiology and pharmacology. Students also conduct advanced research and produce original scholarship. There may be on-campus visits to complete laboratory simulations, while online students may arrange clinical hours with facilities near their homes. Online DNP programs with nurse anesthetist specializations take up to two years to complete if the student already holds a master’s degree and can commit to full-time studies. Full-time options typically run for five consecutive semesters, while part-time DNP programs can be completed online in eight semesters. Synchronous distance classes are usually offered in evening hours to accommodate working nurses however self-paced asynchronous classes can be attended at any time. Students are required to complete independent research and practical projects at their chosen clinical location on topics in nurse anesthesia. The National Board of Certification & Recertification for Nurse Anesthetists has established the continuing education (CE) requirements of 40 hours of credit to be completed every two years to maintain certification. They may be taken at any time prior to application for recertification. CE must be in the postgraduate areas of advanced clinical practice, nurse-anesthetist education, program administration, or independent research. Online learning, per the Board, can include credit for synchronous and asynchronous teleconferences and webinars—however, CNRAs are also required to attend weekend or long-term (14 consecutive days) courses at NBCRNA-approved institutions totaling 40 hours. Students should also explore possible CE requirements through their state medical boards. A foundational review of patient-centered care and concepts of providing safe anesthetic treatment that minimizes complications. Advanced studies in patient assessment, pain neurobiology, pharmacotherapy, pain management and interventional techniques. Over three semesters, students dedicate time to research an original study on an issue in anesthesiology and a scholarly approach to creating evidence-based solutions. Students explore the role of the doctoral prepared nurse in planning, policy, program access, financing and regulation. Students integrate theory with practice in a range of clinical diagnostic or surgical procedures. Does the program culminate with the end-degree that best suits your career goal – beginning, mid-career, and management? Undergraduate programs should be compatible with providing useful theoretical and practical nursing skills. Does the prospective school prepare the graduate for licensing or certification examinations? What are the passing rates on National Certification Examination (NCE) for graduates of the program? Do the courses satisfy general education requirements for students entering the field, or for those transferring to bridge or BSN degree programs? How long does it take to complete the degree and what is the full cost of tuition and labs? What are the entry requirements for the program? Graduate programs can be highly competitive. Have you completed pertinent clinical experience and educational prerequisites? Do you hold current licensing in nursing? What is the institution’s track record? What has been its graduation rate? Has the faculty earned scholarly or clinical distinctions? How does the program support your educational and distance learning objectives? What are institutional requirements for clinical practice or residency? Is the program entirely online or delivered in a hybrid format requiring campus visits? What support services are available in the form of job placement, career planning, employment fairs, and student aid (loans, grants, scholarships)? What is the application format, especially if an interview is required? Is the interview conducted in person, by telephone, or online? Accreditation is the voluntary process through which nursing degree programs are vetted by the Council on Accreditation of Nurse Anesthesia Educational Programs (COA) for academic quality, faculty benchmarks and student support. The COA is the only independent organization for nurse anesthetist program accreditation recognized by the U.S. Department of Education. Institutions without COA accreditation may not be eligible to provide federal student aid programs and graduates are disqualified from registering for the national certification exam. The Commission on Collegiate Nursing Education (CCNE) As part of the American Association of Colleges of Nursing. The CCNE is an accrediting organization for schools offering four-year undergraduate, graduate and residency programs in nursing. Council on Accreditation of Nurse Anesthesia Educational Programs (COA) Voluntary accreditation by the COA provides nurse anesthesia graduate programs evaluation of educational quality and recommendations for improvement. Accreditation Commission for Education in Nursing (ACEN) The ACEN establishes and evaluates specialized accreditation of education programs that lead to postsecondary and graduate degrees in nursing. National League for Nursing (NLN)The NLN Commission for Nursing Education Accreditation serves an accreditation agency for undergraduate (vocational, diploma, associate, bachelor), master and DNP education programs. Students can begin preparing for a career in advanced practice nursing in anesthesia as early as high school by focusing on courses in physics, biology, chemistry, and computer science. To enter the nursing profession, students will need to complete a two- or four-year undergraduate degree. A four-year bachelor’s of science in nursing is a pre-requisite for entry into nursing graduate school, while students with bachelor’s degrees in non-nursing subjects are eligible to enroll in EL-MSN programs. Prior to practicing as a registered nurse, students must pass the national licensing examinations (NCLEX-RN). It’s important for aspiring nurse anesthetists to complete at least one year of acute care practice before taking their graduate record examination and formally applying to an accredited master’s nursing program. Accrue at least one year of acute care experience in ER or ICU environment. Volunteer From high school onwards, nursing aspirants can volunteer to work in nursing homes and care facilities, at emergency aid shelters, civic or spiritual organizations, and non-profit groups. Service looks outstanding on a resume or application. Take advantage of independent learningFree online courses are available in science, mathematics, healthcare and health policy. Students can kick-start their learning and, in many cases, take advanced courses in core subjects required for the nursing professions. Many online classes are developed and led by professors from major universities and medical schools such as Stanford University, MIT, UC Berkeley, and Harvard . Start networkingJob networking can begin as soon as students begin their professional nurse training at the community college or undergraduate levels. Student clubs and associations in science or nursing can offer students many opportunities for building lifelong professional connections or finding mentors. Nursing association may offer discounted student memberships in national, regional or campus-based chapters (find our list of professional nursing associations under the Resources section). Certified registered nurse anesthetists (CRNAs) are highly skilled practitioners who provide diagnostic pain management and anesthesia care in clinical settings. They provide a majority of anesthesia services in rural healthcare, where they represent cost-saving alternatives to physician anesthesiologists. Practice settings include surgical and obstetrical facilities, critical care facilities and hospitals. The U.S. Bureau of Labor Statistics has forecast a 19 percent increase in employment of CRNAs during the 2014-2024 decade, opening up an estimated 7,400 new jobs. Physician Anesthesiologist Anesthesiologists are M.D.s or D.O.s who oversee the preparation, treatment and after care procedures for patient’s requiring anesthesia in clinical settings. $246,320 Doctoral degree in medicine (M.D.) or osteopathy (D.O. ), National Commission for Certification of Anesthesiologist Assistants certification. In order to practice as a nurse anesthetist, graduates of advanced nursing practice programs must hold a current state nursing license and pass the certification exam administered by The National Board of Certification and Recertification for Nurse Anesthetists. Because each state board of nursing establishes its own set of regulations, students should plan on satisfying licensing requirements in their practice area in addition to national nursing licensing protocols. Following completion of an undergraduate nursing degree, students should visit the National Council of State Boards of Nursing to explore the licensing requirements in the states where they plan to practice. In addition to satisfying their state licensing requirements, aspiring RNs must pass the National Council Licensure Examination (NCLEX-RN) in order to practice in the United States. Following the completion of their graduate degree, students may sit for The National Board of Certification and Recertification for Nurse Anesthetists (NBCRNA) examination to begin their practice. For more information, visit the NBCRNA’s page on certification. Every two years, CRNAs need to recertify. Requirements include 40 hours of accredited continuing education, current state licensing and proof of substantial anesthesia practice. Recertification is offered through the NBCRNA. There are basic nurse-training programs and degrees available online for students just entering the profession. Students can test LPN programs that can be completed in a year or less in order to enter the field. Or they can pursue online undergraduate degree nursing programs that take two to four years to complete and lead to broader career options and higher earnings. Online RN programs can take from two to four years to complete and lead to an associate or bachelor’s degree. Class lectures and exams are delivered to distance students entirely online, with practical studies and clinical work arranged with healthcare facilities in the student’s community. Online LPN-to-BSN programs –sometimes called “bridge programs”—are typically accelerated pathways of study that can be completed in one to two years. Because students are already licensed nurses, the curriculum is focused on advanced nursing training, cutting the time to completion. Online LPN/LVN programs can prepare students for entry-level nursing positions in a year or less. These programs can offer beginning students an opportunity to survey the nursing field before committing to an RN program.